As tournament season gets into full swing, this seems like a good time to talk about goals. Here are a few of my thoughts on goals – their importance, how to set them, change them, and keep things healthy. I think setting goals is a great way to start off a season of fencing. And it is important to be realistic. Is your child just starting fencing? Then help him or her decide what goals might be attainable, what are the stretches, and try to keep “pie in the sky” goals out of the discussion. You want to encourage not discourage your fencer. And if goals are quickly reached, celebrate! Then, together, set new ones. By the way, there are short-term goals too. My son and I also always discuss the events before each tournament and what the goal is for that particular event. Beat “that guy”! At a certain point, there will be some fencer that seems to be unbeatable. Name him or her. Then, make beating that fencer a goal. 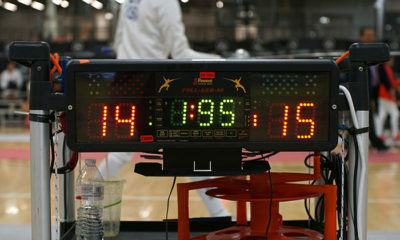 Early on in fencing, we had a terrible tournament. My son was nervous, had stomach cramps, wanted to leave, and begged me to take him home. We had paid the entry fee, driven all this way, I even found a great parking space (again, parking is important!) so no way were we just going to leave. And of course, his fencing at that tournament was not the best. Lost most of his pool bouts. Then came the Direct Eliminations. And my son would be fencing against him. Mr. Unbeatable. And my son beat him. I think my son was eliminated in the next round, but it didn’t even matter. He had proved something to himself. He could beat that guy. He might not win again the next time, but now he knows he can do it. And guess what – There will always be a next “that guy.” Stafford beat a fencer this summer whom he thought was truly unbeatable. He had nicknamed him The Demi-God. And now, my son has the next that guy on his radar. I know that Stafford is now a “that guy” to a few younger fencers. I love that. There is a wonderful family in Northern California with two young fencers. The mom told me at one of the tournaments, when our boys were about to fence each other, that her son was so excited to fence my son. That he had been disappointed that they had not yet met on the strip. He couldn’t wait. He didn’t expect to win; he just wanted to fence him. That day, her son did not beat Stafford, but I’m betting that one day he will. Every August, Stafford and I discuss the past year’s results and talk about goals for the upcoming year. We started this when he was ten, and we have found that it is very helpful to have specific attainable goals that span the year. And I feel it is important to have him be a part of the discussion, so that it is not just me telling him my expectations. We list several, knowing that they can change and evolve through the year. The first thing we do when setting goals is to look at where my son is coming from, how did he do the year before? Set your fencer up for success, not failure. 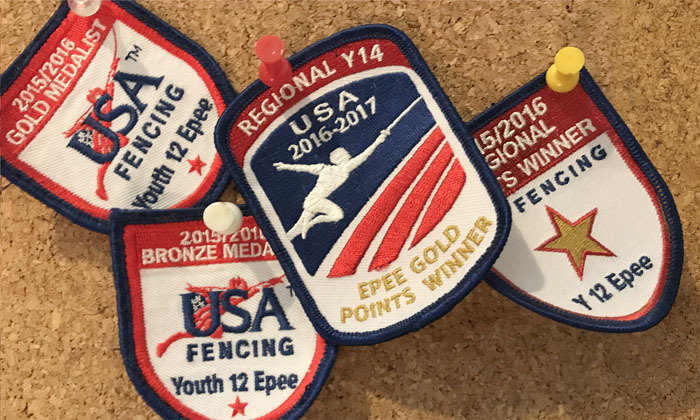 Did you know that US Fencing awards patches in each region to the top three fencers in regional tournaments (RYCs- regional youth circuit)? This is a great incentive for young fencers and a lot of parents don’t even know about this. The patches are given out at Summer Nationals. In 2014-15, Stafford came in 4th in the region, just missing getting a patch. But, Stafford was fencing well, and at each tournament he seemed to grow in confidence, skill, and determination. So, the patch went on the list. This goal was a reach. And he missed qualifying by one, placing fourth in the qualifiers. I was fine with that though. 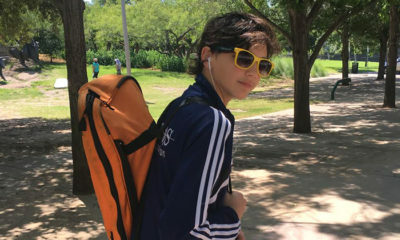 He had just turned 12, fencing against 15 and 16 year olds, and really wasn’t ready, in a number of ways. So, we kept that goal for 2016-17, and he went to his first JO’s last February. We have had fun planning our goals this year. One of them has already been reached, when we went to the World Cup in Austria in October. This is a great read! Our son started fencing 2 years ago, and its great that he can model his goals after your son. 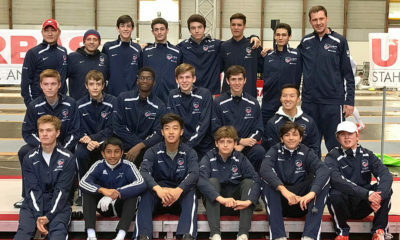 We have learned that the fencing community is small and its great to hear the advice of the more experienced — its so very confusing initially and it took us the 1st full year to get a rudimentary understanding of how things work. Looking forward to reading more. Thanks, Richard! Happy to share our experiences. Hope this gives an idea of some of the goals that are possible, and also to encourage dialogue. Having a plan definitely helps track the year’s progress too.